I love it when a plan comes together. 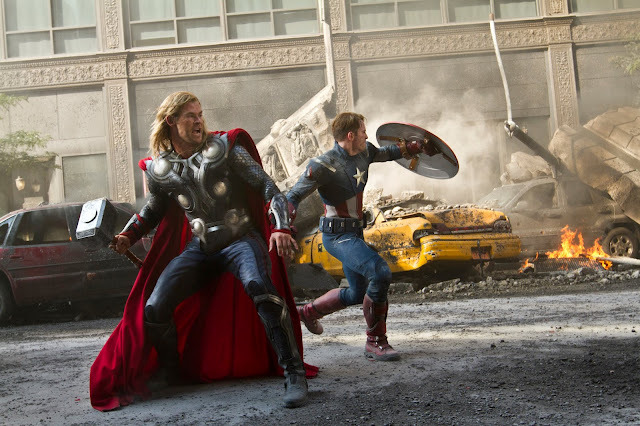 In one of the most ambitious film proposals in recent memory, The Avengers has finally arrived and paid off greatly. Setting itself up back in 2008 with Iron Man and adding on layers through the other four Marvel Comic films that have come since, the massive gamble of bringing in multiple actors, directors, studios, and comic properties has led to what is basically the ultimate Marvel superhero film. Frankly, this film should not even exist. It seems unwieldy to think about combining so many elements into one feature and not have it topple due to the lack of fair balance or the lack of a cohesive and unifying story, but writer/director/comic geek Joss Whedon has managed to pull it off and deliver a ridiculously satisfying experience. The massive roster of superheroes are all given their fair amount of time, the action is incredibly satisfying, and the film has a ton of fun and wit to spare in its screenplay. Minor bumps along the way and the lack of deeper themes beyond “teamwork helps us triumph” notwithstanding, The Avengers is still a huge success assembled from a lot of great pieces coming together to form a fantastic comic book film in many of the best possible ways. In breaking down the story, it is actually incredibly simple to explain. 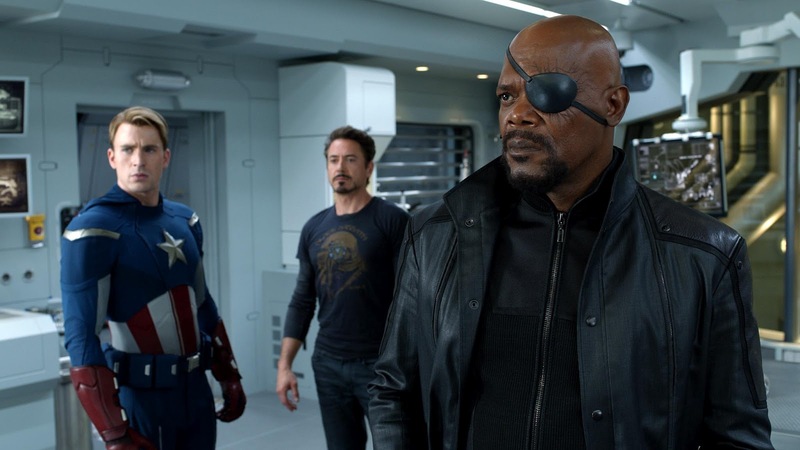 Nick Fury (Samuel L. Jackson), leader of the secret peacekeeping, law enforcement organization known as S.H.I.E.L.D., is forced to recruit all of the known super-powered heroes from around the world and beyond (Iron Man, Hulk, Thor, and Captain America) in an effort to build a super team strong enough to stop Thor’s evil brother Loki (Tom Hiddleston) from destroying the Earth. As Earth’s mightiest heroes all eventually gather, it will serve as a challenge to not only stop Loki, but to successfully work together as a true and capable team. To give a bit of a roll call: Iron Man (aka Tony Stark, played by Robert Downey, Jr.) is all about using his smarts and his wits to help supplement his super suit. Captain America (aka Steve Rogers, played by Chris Evans) is still getting a grasp on existing in present time, after having woken up from a rest that started back during WWII, but he at least knows what his true duty is. 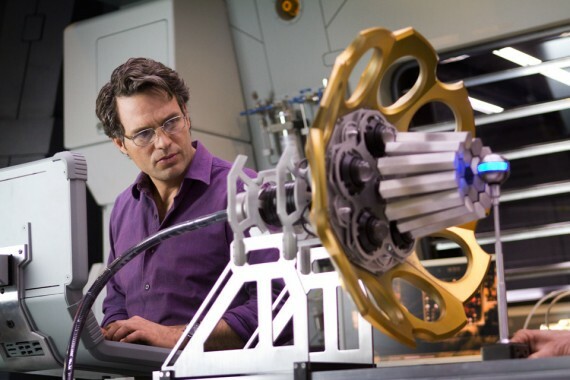 Bruce Banner (aka Hulk, played by Mark Ruffalo) seems to have found peace in helping others at a great distance from the rest of the world, but is still smart enough to know he needs to help S.H.I.E.L.D., even if he risks having another angry incident. Thor (aka the Asgardian son of Odin, played by Chris Hemsworth) has traveled a great distance to deal with his revenge-minded brother, as he wishes to protect the Earth from harm. Additionally, a few S.H.I.E.L.D. assassins, Black Widow (Scarlet Johansson) and Hawkeye (Jeremy Renner), are caught up in the action as well, because it will truly take a highly skilled and powerful team of people to stop Loki, the power he wields, and the army he has brought with him. It truly is some sort of miracle that this film exists; however, when you get a clip of the film that literally has a 360º shot of all of these superheroes, it is safe to say that Marvel Studios and everyone else involved was able to pull it off. And really, who better to be at the head of this massive comic ship than Joss Whedon? Whedon, known to many as a comic book writer, along with the creator of Buffy the Vampire Slayer, Angel, and Firefly (he also co-wrote and produced the recent release Cabin in the Woods), is who many would consider a perfect fit for a live-action Avengers film. He has most clearly established the usage of wry bits of humor in his dialogue, but his work also always does well in establishing true drama buried beneath all the fantastic that is going on. He is also always one to bring an incredible fairness in his balance to women (a notably great aspect, as The Avengers consists almost entirely of supermen). Putting all that forward, it really is great to see Whedon emerge so successfully, as he was basically given the keys to play in the castle filled with comics and toys that he is very familiar with already. Steve Rogers: Big man, in a suit of armor... take that away, what are you? I most admired the balance in this movie. Given that The Avengers has to do a lot to not only establish that there are four main superheroes, a few supporting characters, and a lead villain, I was really thrilled to see that no one got short-changed. Especially in the case of dealing with the very different personalities clashing, this film could have easily become the Tony Stark show featuring a few other super folk, but it didn’t. 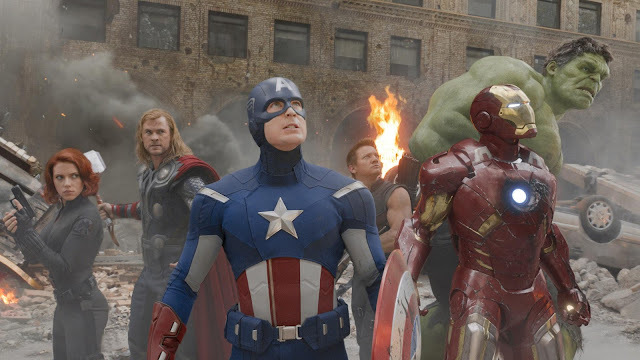 This is a film about the Avengers, and as such, we spend the right amount of time with each character and can properly witness a specific arc for each. As fun as it is to spend time listening to Tony Stark banter with others, it is just as engaging to see Thor deal with a fairly emotional issue of stopping his own brother, or having to relate to the attempts by Bruce Banner in his struggle to maintain his solace, let alone deal with the repercussions of the raging alter ego lurking within. Even the master archer Hawkeye (aka Clint Barton) has his own arc, as he deals with Loki’s manipulation. The actors are certainly up to the task of delivering big for this film. Robert Downey, Jr. continues to embody Tony Stark tremendously, even managing to add a few layers, while still providing plenty of humor. 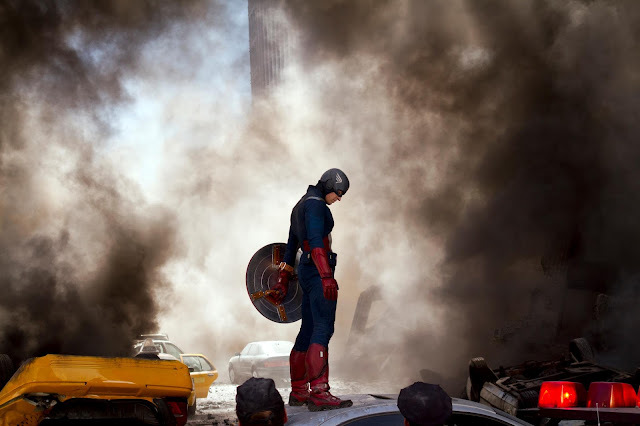 Chris Evans continues to capture the same earnestness that makes Cap such a strong character, even if some reported scenes of him further dealing with his present reality were left on the cutting room floor. Mark Ruffalo is maybe the best Bruce Banner of the recent three (though I did like Bana and Norton, regardless of the films), providing the proper sense of reluctance and struggle in balancing the two sides of himself, while still being fun to watch (the intro scene of him with Johansson is great, as is watching him talk smarts with Stark). Hemsworth also continues to make Thor just incredibly fun to watch, as he gladly embraces the fish-out-of-water aspects of being a super-powered being interacting with earthlings. As for the rest of the cast, Renner is basically great in everything he does, so watching him basically play cool as ice was very satisfying. I liked Johansson more here than I have in anything in a while, which I think is a testament to the strong role that Whedon has afforded her. Samuel L. Jackson, after practice rounds with the Nick Fury character in small portions for the past four years, gets more to do this time around and certainly maintains a certain badass stature, though I am hoping to see more from him in the future with more regard for the deeper layers of someone in charge of a super-secret organization. Clark Gregg, who has slowly built plenty of charisma as S.H.I.E.L.D. Agent Coulson, gets in his moments as well; playing up his dry humor, while also hiding the excitement of seeing all of these guys come together (he collected Captain America’s trading cards). And lastly, Tom Hiddleston continues to make for a wonderfully complex villain, as his Loki is still both duplicitous as well as crushed and conflicted on an emotional level, filled with anger and a desire for power. 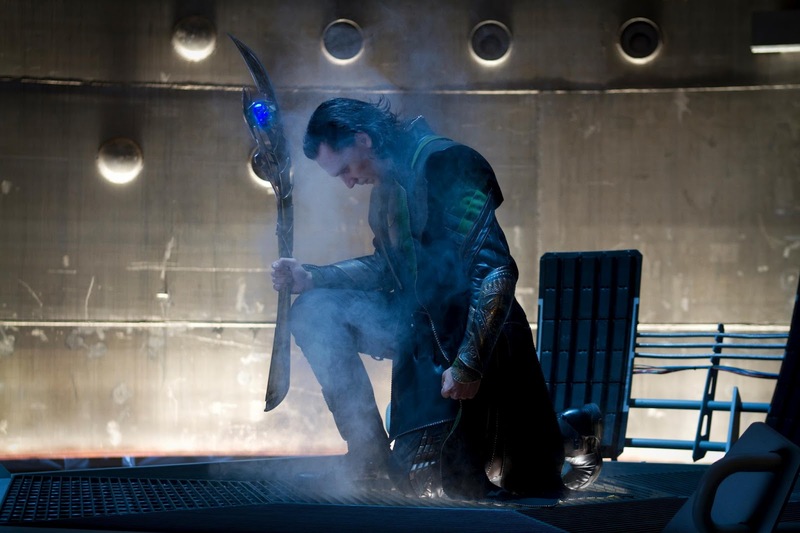 Hiddleston makes Loki a villain that is fun to watch an interesting when it comes to seeing him interact with the others. As there are plenty of highlights in this film, which I have not spoken of yet, let me first address some of the poorer aspects of this film. To start, the beginning feels pretty bland. Essentially a 10-minute cold open, the start of this film feels off-balance in how it sets up the remaining 2+ hours. The dialogue doesn’t come off as strong and there’s a certain “whiz bang” factor that isn’t fully there, despite some expensive looking stuff going on. 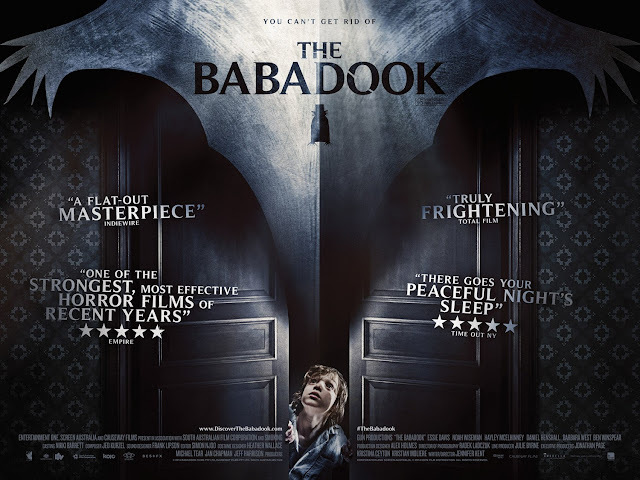 Mirroring that response, the very end of this film sets up fake and somewhat predictable suspense, followed by a summation of things that occurred, which could have been better handled. It does also seem almost too simple in how the plot has been realized. 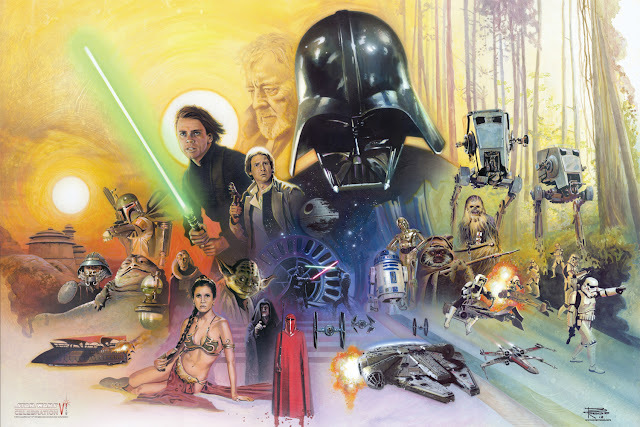 By that I mean the film doesn’t do much beyond establishing that a bunch of really powerful guys (and some gals) need to get together, work together, and stop evil. Now I don’t need much more than that, when it comes to something like The Avengers, but knowing that Whedon could have easily delved into some stronger additionally themes (which we only see in small doses), it does make me hope that future Avengers films will have more to say. This could be partially blamed on the plot, which is simple, yet busy in the way it constantly adds various details onto the basic design of the film, which leaves little time for added motifs. 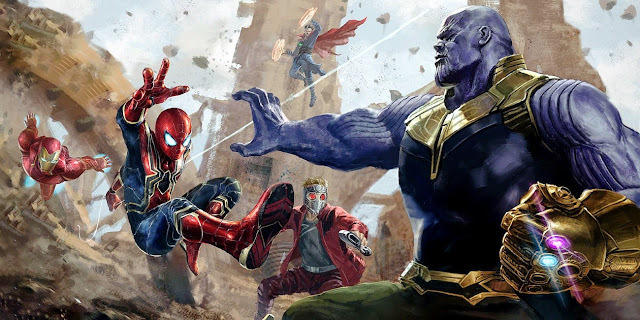 Lastly, as seen in all the previews, we know that the third act of this film is an epic battle that pits the Avengers against an extraterrestrial force, but those enemies, while intimidating, have little to offer in terms of getting us to see much in what they are fighting for. The cheap and easy answer for this is that power always makes everyone want more, but given that the film starts off with Loki describing his plan to some unfamiliar character and then rides on without further exploring who this army is that is supporting him, it left me with wanting just a little more justification for their presence. Getting back to why there is still an incredibly strong 2 hours of film to enjoy, I think a lot could be made from the fact that people are basically supposed to have seen five different films in order to fully enjoy The Avengers, but I do not think that is necessarily true. Of course, it does help to be familiar with the people you are going to be following for the length of an entire film and each character has had one or two films of their own; however, Whedon (as well as story developer Zak Penn) has done a pretty great job of creating a film that is able to establish who these characters are well enough, without dragging the flow or spending too much time with any one character. I will say that Thor is the one film (and Captain America to an extent), which really should be watched in order to be the least confused about what is fully going on, but this really is the kind of blockbuster film made for mass audiences to enjoy and not just all of the comic geeks that have been salivating for a film like this for decades. 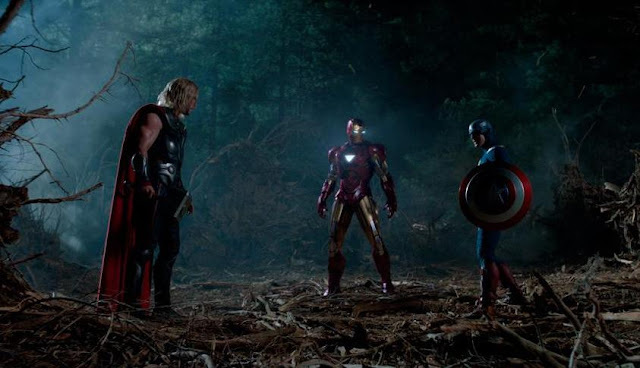 Now let’s get down to that other thing, the part that relates to that epic 360º shot of all the Avengers. When this film fires on all cylinders and has all these heroes doing things that they are known to do, the film truly shines. A few pretty astounding scenes involve Iron Man, Captain America, Thor, Hulk, Hawkeye, and Black Widow all performing the incredibly feats and signature moves they are capable of and it is freaking awesome. Seeing Iron Man bounce lasers off Captain America’s shield into a bunch of enemies or the Hulk bounding great heights and landing his fists into enemies or seeing Thor’s Hammer and Hawkeye’s arrows all aid in doing crazy things is simply fantastic. The action in this film is wonderfully realized, never hard to understand, always clearly presented, with fantastic moments that feature long shots zooming between our different heroes. The effects are top notch as well and kudos to ILM, among the other special effects studios, for really delivering the goods. 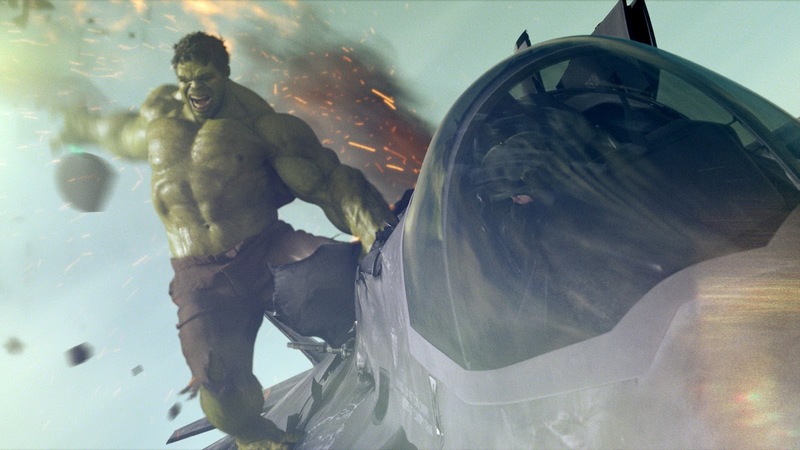 Putting it simply - Hulk looks great in this film. The interaction between humans, heroes, aliens, and buildings feels consistent enough and does well to communicate a good sense of weight. It is always cool to see Iron Man flying around, Cap’s shield bouncing around, and Thor’s hammer traveling great distances on its own. 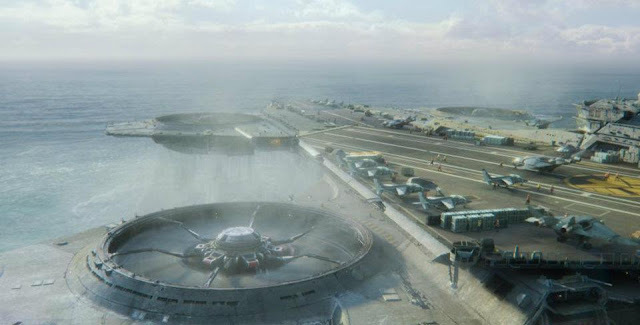 And seeing the S.H.I.E.L.D. Heli-carrier (a flying aircraft carrier) in action was wonderfully satisfying. Even the 3D conversion is strong enough to not make it too much of an issue. In addition to the great deal of action in this film, it is just a lot of fun seeing all of these people interact with one another. I have already mentioned the Whedon dialogue, which serves this film well, but actually seeing Stark and Banner talk science, Thor and Cap argue for their causes, or Nick Fury tough talk all of them, is just a lot of fun to listen to and rewarding to see witnessed in an actual, live-action film. A benefit of this film is how it feels like a comic book in the way scenes are presented. Dialogue comes fast and quick, framing is set up in very particular ways, and action, in various forms, is properly punctuated throughout. Few films that ride under the “comic book movie” banner gave me that similar feel (which includes the ambitious, but much maligned Hulk). In praising how this film feels like a comic book come to life, that should not rule out the fact that the dramatic moments and stakes in this film registered just as important as the ridiculously fun aspects of the film. Putting the Earth in peril is one thing (the darn planet can never stay out of trouble), but dealing with a character like Thor, who is worried for Loki, despite having to deal with fighting against him or Captain America, who learns to what end times have changed, or even Black Widow, who holds a strong concern for Hawkeye, when things get turned around on them, is important stuff that is not simply looked over. One particular dramatic beat does a lot to stir this group together in an effective way that has come from crafting together an assembly of well-drawn characters. 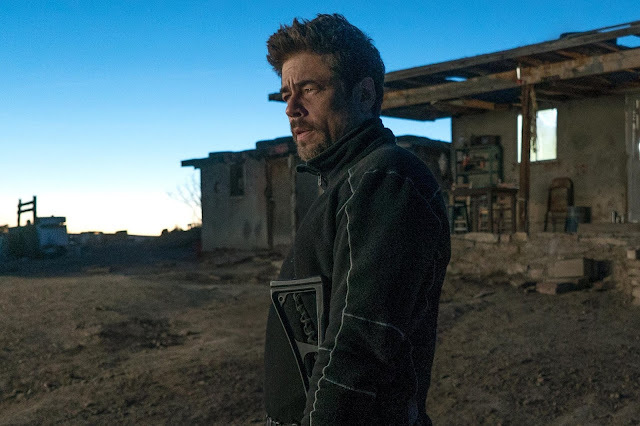 This film has a soul and does not just play out like an empty-headed blockbuster film, with little concern for the characters we are rooting for. Some other odds and ends before I close. I mostly enjoyed the score by Alan Silvestri. It brings a vibe that contains themes for each characters and does well at adding to the moments, though I wish a bit more was done in creating a strong theme for the Avengers as a team. Maintaining the cinematic continuity between films was also a great touch. While I may have missed seeing certain other heroes join the fight (what was War Machine doing, was he busy? ), I was happy to see that the previous films were properly respected with regards to this film that unites everyone. And lastly, I can’t emphasize enough how cool Hulk is. The Avengers feels like some professionals managed to gather a bunch of the best Marvel Comics and toys and let a bunch of fans in on seeing how well they know how to play with them, and then let them see that again and again. The film delivers in all sorts of awesome ways. Coming off of an ambitious investment, this is a film that brings together every one of these recent Marvel heroes for the film that is the culmination of a lot of hard work and effort. 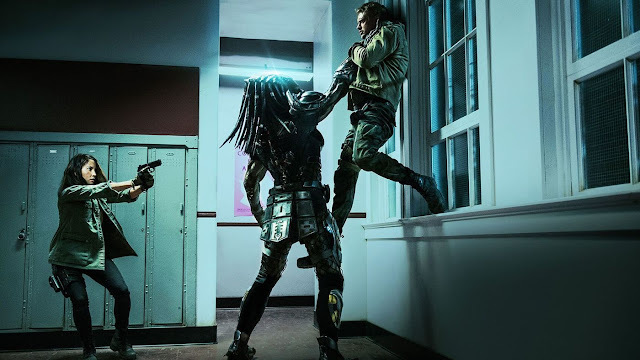 The payoff is a hugely entertaining spectacle, which is benefited by wonderful action, fun dialogue, fine work by the actors involved, awesome special effects, and some other ingenious elements that make this film all the more satisfying to behold. 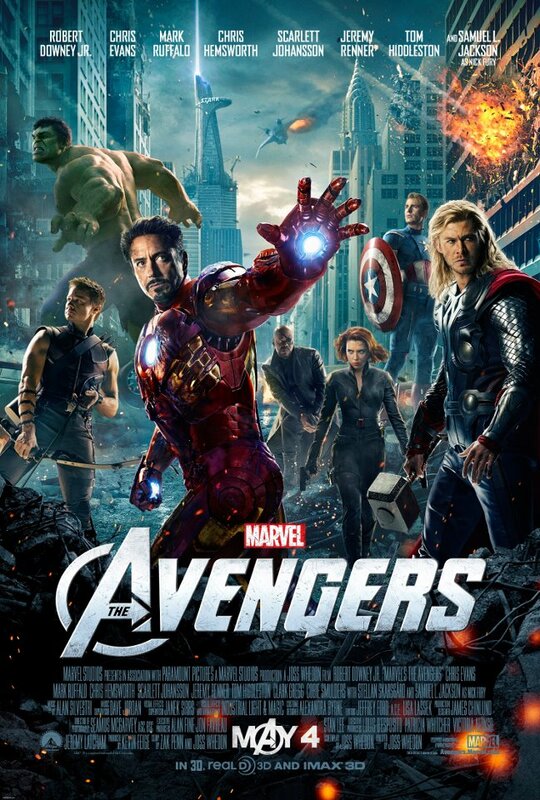 The Avengers have certainly assembled and this is a fine adventure that will be enjoyed by many. Tony Stark: When they come, and they will come, they'll come for you. I liked Thor and Iron Man, not so much Incredible Hulk, haven't yet seen Iron Man 2 or Captain America. Great review. It seems like forever that I've been waiting for this, and now that it comes out, it suddenly feels early.